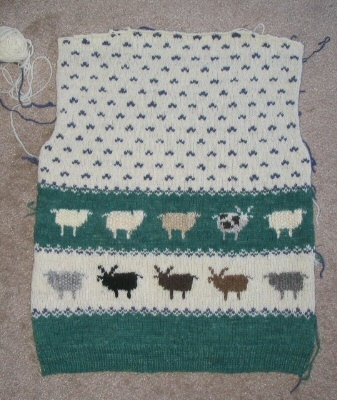 I have completed the back of my Rare Breed Sweater. I am a fairly slow knitter, so for me, this is good progress! It is being knitted entirely of rare breed yarns. The body (both the white and the green) is Ryeland, and the blue in the seeding pattern and peeries is Hog Island. The sheep are intarsia knit and each one is of a different rare breed sheep wool. Top row, starting at the left: Tunis, Ryeland, Karakul, Jacob, and Wensleydale. Bottom row: North Ronaldsay, Hebridean, Soay, Manx Logthan, and Lincoln. I will embroider in the eyes and facial outline later. It is interesting to knit a row using 6 different types of yarn. The differences are very pronounced. I could spot the Jacobs immediately! How cute! 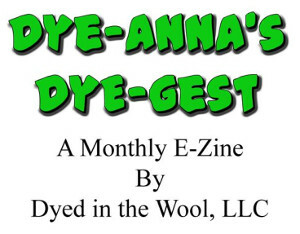 It's great progress - especially carrying all those yarns. I love it! Great! I love that you made the Jacob sheep spotted and the horned breeds horned! Are you using the same breeds on the front? Do you need any more? I have a spun ball of Holmie, the seaweed eating sheep of Papa Westray, and small fibre amounts of French Charolais, Texel and some Welsh blackface. I can post if you need them. I love it! It means so much more to me now that I have been diligently collecting rare breeds and unusual spinning fibers than it would have prior to my starting to spin! I love your details about each sheep, too. Great job, and thank you for your contribution to my rare breed project, too! My sister spent a New Years Eve on North Ronaldsay and she told me about the sheep. Apparently, they eat seaweed and will stand on the beach munching away while the waves crash over them. She never got close enough to find out what their fleece was like and I have always wondered what kind of fleece would a sheep that constantly gets bathed in icy salty water produce. I would think that it would be a bit coarse, but I may be wrong. Looks great Leigh. Such detail in all the sheep. Wow! You'll definitely finish it in time for some cold weather, no problem! I absolutely love it...what a beautiful work of ART!!!!! Wow, what a project! Beautiful work. The weaving is beautiful, but this sweater is fantastic! I love the Jacob sheep! OMG...Tina mentioned about your site and it's wonderful! Where did you find the pattern for the Rare Breed Work-in-Progress? It's great! Hi Kathy, thank you so much for you nice comment! The pattern is my own, I'm pleased to say.